A decision Monday night regarding construction of a new parking ramp in downtown Eau Claire dealt more with space for bicycles than motor vehicles. The availability of bike parking in and around the proposed ramp dominated the city's Plan Commission meeting. The commission, after hearing testimony from three citizens, including Councilwoman Catherine Emmanuelle, unanimously approved the site plan for a three- or four-deck parking structure in the North Barstow Street area. 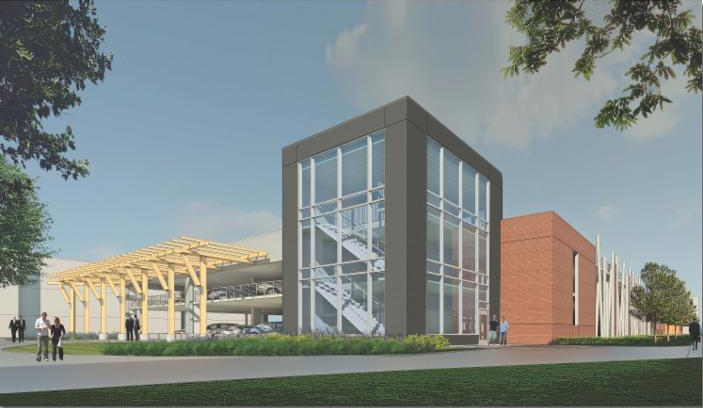 A triple-deck ramp, which would have about 570 stalls, is estimated to cost $9.6 million, with an uncovered fourth deck adding another $2.4 million, according to city engineer Dave Solberg. If a three-level ramp is eventually approved by the City Council, it would cost about $5 million to later add a fourth level and would require closing the existing ramp for many months, he said. Emmanuelle and Bob Eierman, chairman of Eau Claire's Bike Pedestrian Advisory Commission, requested the commission recommend to the City Council that the ramp area have bike space equal to 10 percent of the number of ramp stalls. City ordinances do not require a 10 percent figure for public parking, Solberg said. Plans show the ramp would have two elevators, vehicle access on two sides with entrances and exits to Galloway Street and Riverfront Terrace, have an earthen-brown exterior and pergola matching that in Phoenix Park.